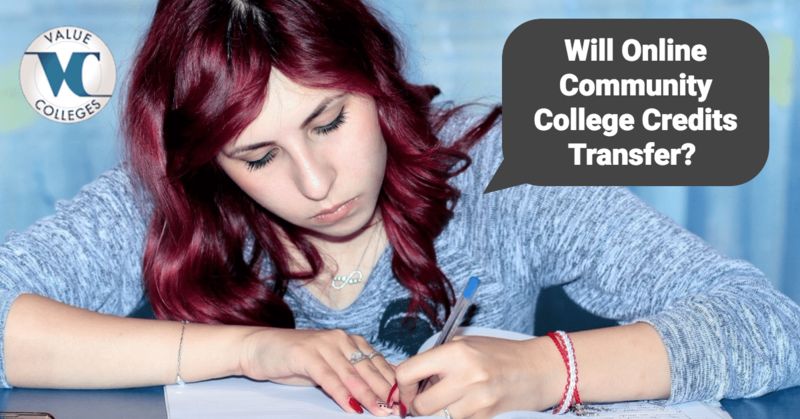 Will Online Community College Credits Transfer? It’s well known that community college is one of the most affordable ways to earn college credits, as well as one of the most convenient. Online community college courses, and even full degree programs, are more convenient still; while most states have community colleges in every region, online degrees are usually accessible statewide, and don’t require attendance on-campus at all. And students are using the opportunities available to them; well over 6 million students were enrolled in community college in 2015, accounting for 38% of all undergraduates. However, many community college students don’t intend to stop with a one-year diploma or two-year associate’s degree; according to the Community College Resource Center (CCRC) at Columbia University, as much as 33% of community college students will transfer to a four-year university when they complete their associate’s credits. That may make some online community college students concerned. Will my online community college credits transfer to a four-year university, or will I be stuck having to take the same classes over again? Whether you’re a traditional-aged college student taking courses at a community college to save money, or a working adult going back to school to earn that degree you left behind, you’re probably thinking about transferring to a bachelor’s program after you’ve cleared out those basic courses. One key part of getting your associate’s degree at a community college (as opposed to a private trade school) is that most public community colleges already have clearly-established relations with the public colleges and universities in the state, as well as with some private institutions. These are usually called “articulation agreements,” and they lay out the terms of transferring. In North Carolina, for instance, all 16 public colleges and universities take part in the Comprehensive Articulation Agreement, so a student earning credit at a North Carolina community college can transfer their credits to a public institution, and if they have completed their associate’s program, can automatically enroll as a junior. In many cases, community colleges work out agreements even beyond their own public higher education system. At Western Wyoming Community College (Value Colleges’ #1 Best Value Online Community College), for example, online students are guaranteed transfer to Wyoming’s public universities, as well as other well-known online educators such as Regis University and Ashford University. Degree-completion programs are the most common form of online bachelor’s program, and community college students can usually rest assured that most degree-completion programs are very generous in accepting transfer credits, and even work experience, for online students. Colleges and universities are adapting to the needs of students, and since most online degree-completion students are working adults, the institutions realize that accepting older credits, online credits, and work experience is key to helping these students succeed. So have no fear: in almost every community college, online courses are given the same value as conventional on-campus courses; it makes no difference if it’s online or on-campus, you get the same credit. As long as your community college has an articulation agreement with the school you’re transferring to, you can rest easy, and even if it doesn’t, a call to the registrar’s office can help clear up any bumps in the road.